 HUNTINGTON BEACH, Calif. – The Surfers’ Hall of Fame is pleased to announce Ben Aipa, Herbie Fletcher and Brett Simpson as its 2018 class of inductees. These surfing legends will have their hand and footprints immortalized in cement for the ages on Friday, August 3rd at 9:00 a.m. in front of Huntington Surf & Sport. “We are honored and excited to induct these three great surfers and thank them for their contributions and achievements to our surfing world,” said Surfers’ Hall of Fame founder Aaron Pai. The Surfers’ Hall of Fame induction ceremony pays tribute to those individuals who have made an indelible mark on the sport, industry and culture of surfing. Annually, tens of thousands of visitors travel to Huntington Beach’s downtown area and literally walk in the footsteps of surfing superstars and legends from several eras including Laird Hamilton, Andy Irons, Jack O’Neill, Robert August, Bob Hurley, Sean Collins, Kelly Slater, Lisa Andersen, Gerry Lopez, George Downing, Shane Dorian, Greg Noll, Corky Carroll, Shaun Tomson, Rob Machado, Timmy Turner, Shawn Stussy, Rabbit Kekai and many more, who are already immortalized in cement. 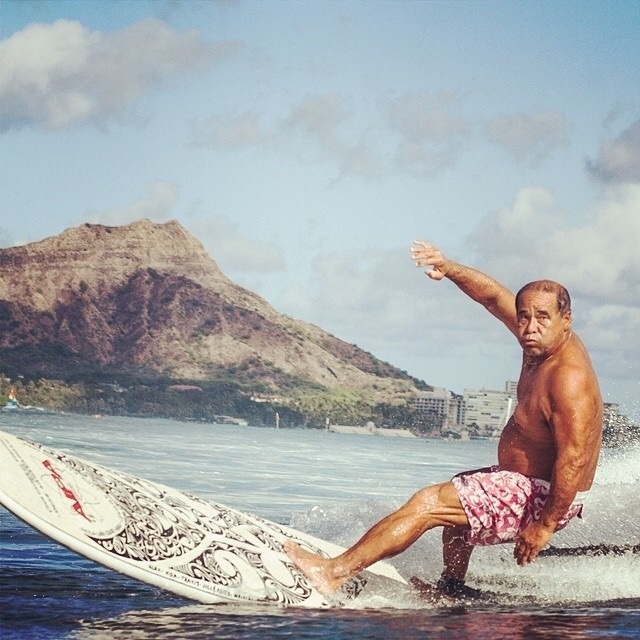 Legendary Hawaiian surfer and shaper Ben Aipa was born in Honolulu in 1942. The son of a sugar plantation worker, Aipa initially planned on an athletic career in football, but switched to surfing due to an ankle injury. He trained for surfing with the passion he had developed as a linebacker, not missing a day in the water for all of 1965. Although one of the era’s fiercest looking competitors, Aipa learned to augment his strength with agility and finesse. Ben was a finalist at the Duke Kahanamoku Invitational Contest at Sunset Beach in 1966. He went on to finish fourth in both the 1967 Makaha International and the 1975 Lightning Bolt Pro as well as competed in both the 1968 and 1970 World Surfing Championships. However, it's as a surfboard shaper that Aipa has made his most significant mark in the world of surfing. He made the board that fellow Hawaiian Fred Hemmings used to win the World Championship in 1968 and founded Aipa Surfboards in 1970. Ben invented the doubled-edged swallowtail design in 1972 and followed this with the split-tail design in 1974. 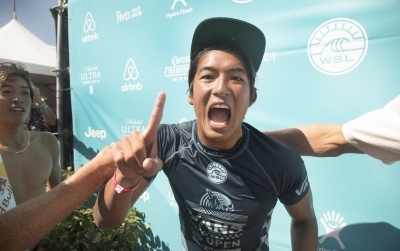 Aipa has served as an informal coach and trainer to such top surfers as Michael Ho, Larry Bertleman, Buttons Kaluhiokalani, Mark Liddell, Sunny Garcia, Brad Gerlach, and Kalani Robb. Aipa won the grandmasters division of the 1989 United States Surfing Championship and the legends division of the 2000 U.S. Championships. Ben was named one of the Top Ten Shapers of All-Time by Surfing magazine in 2004. Both his sons Akila and Duke Aipa also are accomplished surfers and surfboard shapers. Born in Pasadena in 1948, Herbie Fletcher began surfing at age nine and was a semifinalist in the 1996 World Surfing Championships. By the end of the 1970s, Herbie had purchased Astrodeck (a maker of non-slip coatings for surfboards), founded Herbie Fletcher Surfboards in Dana Point and was among the leaders of the longboard resurgence. His creation of a peel-and-stick version of Astrodeck turned the brand into the sport’s best known accessory utilized by nearly all of the world’s top surfers. In the mid 1980’s Fletcher ventured into surf videos, releasing Wave Warriors, a series of promotional videos for Astrodeck followed by the Adrenaline Surf series. In the winter of ’85, Herbie gathered together surfers and surf photographers in front of his house at the Banzai Pipeline for the first of what has become a three decade long tradition to promote his latest film. Herbie was on the vanguard of the tow-in surfing movement, riding 25-foot waves at Waimea Bay on his Kawasaki Jet Ski and in 1987, years before Laird Hamilton popularized the technique, he towed in Martin Potter, Tom Carroll and Michael Ho into 12-foot waves at Pipeline. 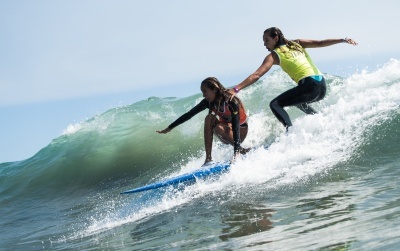 Leader of the Fletcher surf dynasty, Herbie’s wife Dibi is daughter of surf industry icon Walter Hoffman and sister to two-time World Champion Joyce Hoffman. Herbie’s oldest son, Christian, was a trailblazing aerial surfer in the 1990s while son Nathan, a world-class surfer in his own right, branched out into skateboarding, motocross and snowboarding. Both were shamelessly promoted in their father’s videos. Grandson Greyson follows in the Fletcher clan footsteps as one of the world’s best skateboarders while the youngest Fletcher, Laser, is not far behind. Born on January 5, 1985 in Long Beach, Brett “Simpo” Simpson grew up in an athletic family where sports like football, basketball and baseball were second nature. His father, Bill Simpson, was a tough defensive safety with the Los Angeles Rams in the 1970s. Stories of performing under pressure with big money on the line were par for the course. When Brett was 12 years old, he and his friends decided to give surfing a try. He had a rough start, but the challenge of this new sport intrigued him. Although the family lived in Garden Grove, Brett managed to surf several days each week making each session count. As Brett’s skills developed, Bill encouraged his son to focus on surfing. Brett’s style caught the eye of Andy Verdone, legendary coach of the Huntington Beach High School surf team. Simpson transferred to Huntington High during his junior year. Simpson became a local star, riding the break on the south side of the Huntington Beach pier. 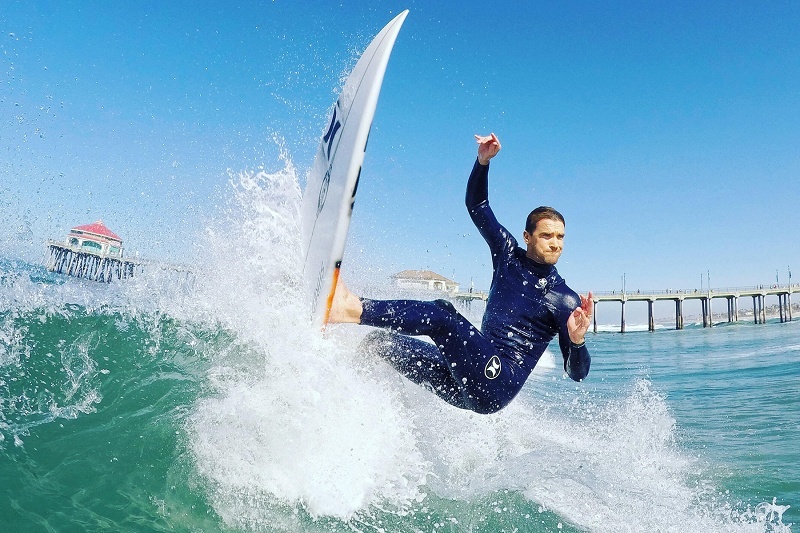 He surfed in National Scholastic Surfing Association contests, then after graduation turned pro and began to compete in the professional qualifying series. By 2005 he had won “rookie of the year” honors at the Hawaiian Triple Crown of Surfing and was the 2008 and 2009 ‘Orange County Surfer of the Year’ award recipient. Brett’s career reached stratospheric heights when he defeated reigning two-time World Champion Mick Fanning to win the 2009 US Open of Surfing title and its unprecedented $100,000 prize. 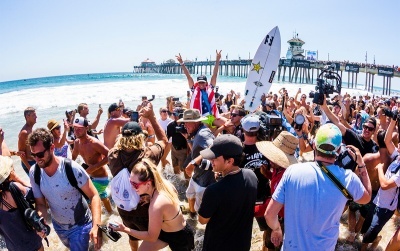 Simpson accomplished the unheard of in 2010, taking down then nine-time world champion Kelly Slater and the world’s number one rated surfer, South African Jordy Smith, to become the first surfer to win back-to-back U.S. Open Championships and pocket another 100 grand check. Brett is now balancing surfing with wife Danielle and two groms. The Huntington Surf & Sport is located at 300 Pacific Coast Highway, Huntington Beach, California 92648.